Summary: Nearly eighteen, Molly Ayer knows she has one last chance. Just months from "aging out" of the child welfare system, and close to being kicked out of her foster home, a community service position helping an elderly woman clean out her home is the only thing keeping her out of juvie and worse. Before we even got started discussing this book, moderator Carissa Rasmussen had each of us choose one picture out of many that were spread over the center table. Each picture was of a young child or teenager. We picked up whichever picture spoke to us and then settled in to discuss. The idea behind the Orphan Train was to give the orphans on the streets of New York City a chance at finding loving homes. The other piece of logic behind the creators of the Orphan Train was that at the same time it would get rid of some of the riff-raff causing trouble on the streets. So they loaded up the kids and headed west, stopping at cities along the way to letting the good folks of the town pick a new child to bring home. The Orphan Train Movement began in 1854-1929 and more than 120,000 children were placed. What may have started as a good idea turned into children being forced to work in factories and endure all sorts of abuse. The fallout from the Orphan Trains eventually would inspire the Foster Care system. This book is the fictional account of one girl, Vivian, who is based on snippets of truths from many children who went through the process. 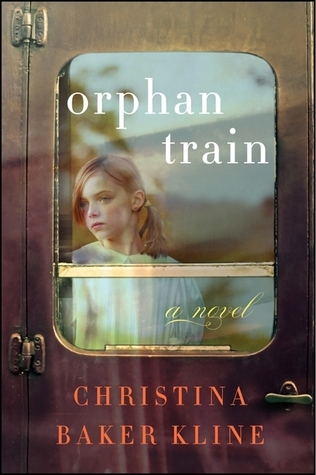 Christina Baker Kline tried to take out the extremes so that her book would represent the average experience (which was anything but average) of the children placed on these trains. At this point many of us shared personal stories about adoption or foster care. It was a very touching and heart-wrenching discussion. 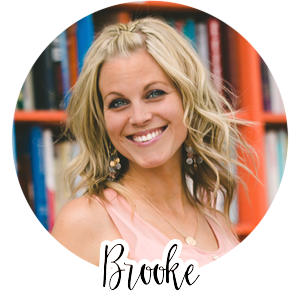 Then we moved into the Top 10 Questions that Christina Baker Kline gets asked for Book Clubs. She has even made a video of her answering them! Something that really stood out to us was that a lot of the survivors from the Orphan Trains didn't ever speak about what they went through until some of their children began to ask questions and urge them to tell their stories. We really enjoyed the way Christina Baker Kline went back and forth between Vivian's perspective and Molly's. The relationship between the two of them was so fantastically layered and complex. It was like they were kindred spirits but just born in different eras. They each answered something in one another that no one else could. Here are a few of our favorite heart-wrenching quotes. "Yes, I do. I believe in ghosts....They're the ones who haunt us. The ones who have left us behind." Vivian has come back to the idea that the people who matter in our lives stay with us, haunting our ordinary moments. They're with us in the grocery store, as we turn the corner, chat with a friend. They rise up through the pavement; we absorb them through our soles. The things that matter stay with you, seep into your skin. We loved the relationship between her and Dutchy. We cheered when anyone showed even the most basic shred of decency to Vivian. We were elated when Vivian was able to connect with Molly and we got choked up over the way Molly was able to help Vivian. This was a tough book to discuss in some ways because it's such heavy topic matter. Several of us cried more than once in this book! But don't worry, Christina Baker Kline wraps it all up neatly at the end so you won't go into a tailspin. This book is equal parts heart-wrenching and heart-warming. 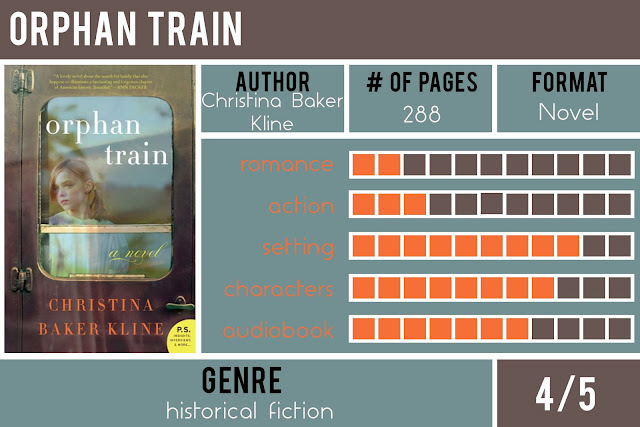 Orphan Train is a great book club discussion book and we recommend it to everyone. You will become a better person for having read it.